A look at the often ridiculously caricatured portrayal of Americans in anime, and why they are so heavily stereotyped. It's easy to spot an American in an anime. They're cocky and confident. They're loud and belligerent. They're nearly always blond. Where does this American stereotype come from and why does it still exist? 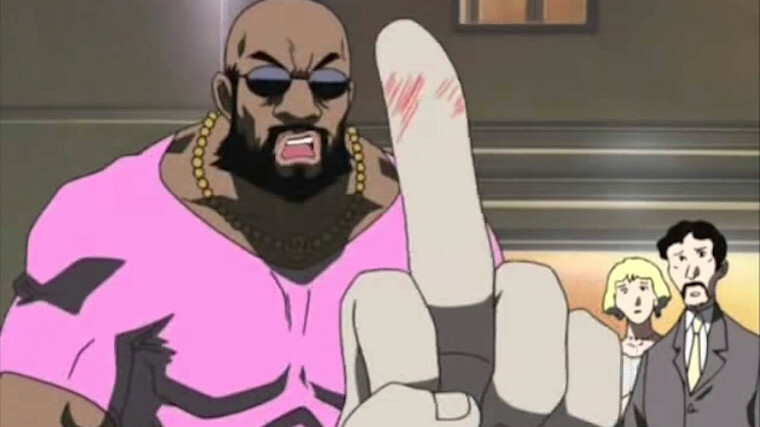 By taking a look at some Americans in anime, we begin to see how a different culture views the American culture, and why it isn't always very flattering. When an anime needs to throw an American into the mix, they are almost always a stark contrast to the more reserved Japanese characters. The American character generally falls into one of two categories. If you need to establish that your Japanese character has been relocated into an American setting, just throw in a belligerent American. Legend of Black Heaven infamously did this in the clip above, where a man with a laughable voice immediately rushes into a confrontation over what is clearly caused by a cultural gap. This stereotype of Americans portrays them as hardened city dwellers, quick to anger and mistrustful of outsiders; a foreigner walking into a group of these brutes is akin to a newcomer walking into a local saloon in a Western. Classicaloid does this when a character accidentally winds up in an American city. Mad Bull 34 is a literal caricature of this trope. Whether the offending party is dark- or light-skinned, Americans on their home turf are certainly a force to be reckoned with in anime. On the other hand, when you have an American visiting Japan they aren't your typical inner-city thugs. Americans who travel abroad are an entirely different species. These are the blond-haired, blue-eyed characters, with handsome men and beautiful curvy women. These types of Americans are often portrayed as gung-ho, overconfident, often arrogant beautiful creatures. Many times they're completely ignorant of Japanese society, and make no attempts to conform or learn the rules of the culture they're surrounded by. Some, like Lucky Star's Patricia Martin spout nonsensical Japanese they learned from anime. 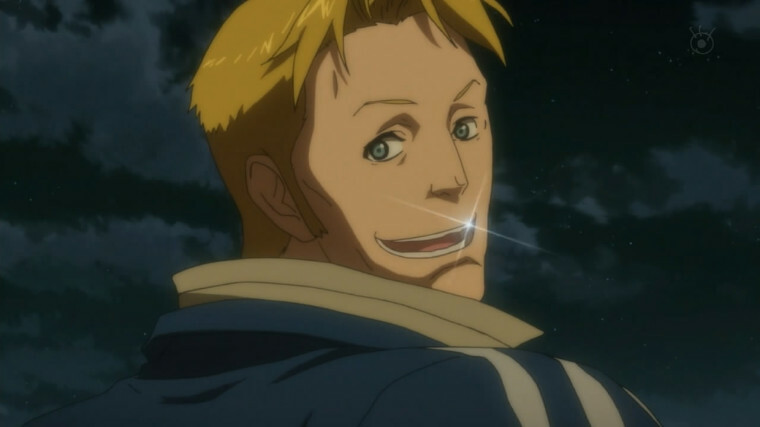 Others, like Ray Focker from the Macross series are patriotic while still having an appetite for women and liquor. Perhaps the best example of this American character trope is, well, America himself. He is the embodiment of American stereotypes, a well-meaning but ultimately kind of obnoxious guy who would rather do things his way than conform or listen to advice. These Americans are like the fun friend who hit on all the girls then made a scene at last year's Christmas party; they're fun in small doses but you wouldn't want one as your roommate. Still from Yakitate!! Japan of Renaissance man Brad Kidd. Of course there are exceptions to everything, and not every American anime character is a caricature. Black Lagoon has a main cast that consists of a number of Americans who are portrayed with equal depth to their Japanese counterparts. 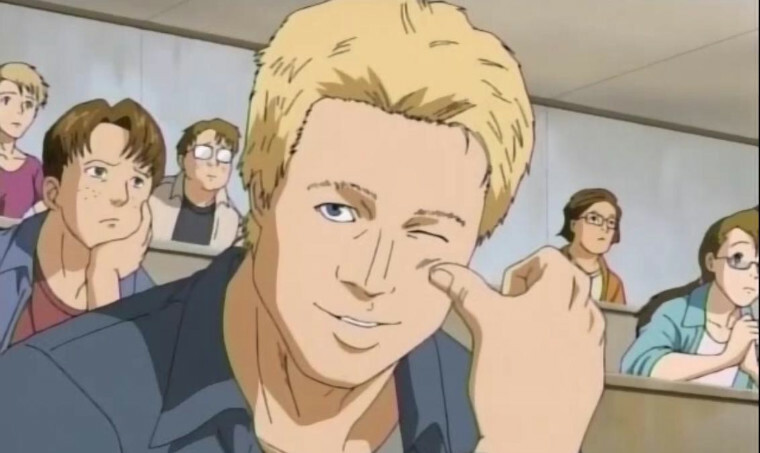 And then there's Brad Kidd from Yakitate!! Japan, the lawyer-detective-mother-doctor who is in no way a reference to a certain American actor. The exceptions do exist, but for the most part Americans are basically a running gag in anime. 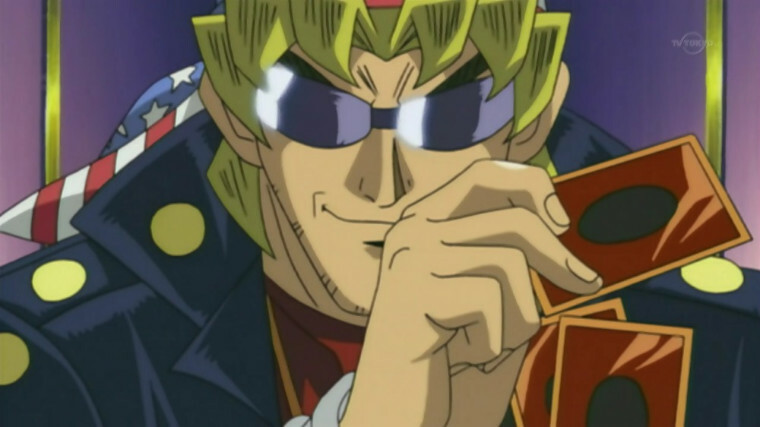 Still from Yu Gi Oh of "Bandit" Keith Howard. So Americans have their own image in anime. But… why? Aside from the fact that they're just so easy to make fun of (they practically do it to themselves), there are a number of explanations for this. On one hand, it's a way to condense an entire culture into something a Japanese audience would immediately recognize, in the same way American cartoons tend to exaggerate foreign features and tack on stereotypes like the Smart Asian, the Loud Latina, and others (which, to be fair, is not done as widely anymore). By molding these characters into a stereotype, viewers can easily determine culture and origin, which is cheap way to give a character background and depth without actually having to do much work. While this reasoning is fairly innocent (the idea is to poke fun, not condemn), there is another underlying reason for this treatment of Americans in anime. In today's Japan, American tourists are welcomed -- as long as they don't actually stay there. Foreigners in general are seen as potentially weakening Japanese culture, which is steeped in tradition and social rules unique to the nation. Clearly not everyone feels this way, but the sentiment nevertheless exists. For that reason, Americans living in Japan are often met with a certain disdain for their inability to conform and adhere to Japanese culture and its societal rules. It's a sentiment felt all over the world and throughout history. Maybe one day the world as a whole will learn to look past cultural differences, but for now we'll just have to do with our bleach blond anime Americans. Anime covers practically every genre and audience. So why hasn't every TV station aired anime that could fit their style and demographic? If any network execs are reading this, consider these suggestions for anime series that could do well on American channels! Over the years we've seen a number of anime brought to America and slapped with a new opening; but just how good or bad were they? Let's find out! In the early-mid 2000s, US licensing companies were involved in numerous anime Production Committees. It didn't go so well for them. This year, several US licensors are trying their luck on Production Committees again. Will it go better this time? In the argument of subs vs dubs, everyone is entitled to their own opinion (even if you are a filthy dub-loving anime fan). Hopefully these are ten English dubbed anime that we can all agree are horrible - no matter what your persuasion.